Yesterday I baked my first loaf of real sourdough bread in many years, using my new sourdough starter. Oscar, as I have come to call him, has already been through some adjustments since he was first ready to use: I started out with a mother starter from Peter Reinhart’s Whole Grain Breads , using 100% whole wheat flour and a hydration level of 75%. Most of the sourdough recipes I have been looking at call for a 100% hydration starter, however, so as I feed Oscar, I have been slowly increasing the moisture content. At the same time, I have moved from 100% whole wheat to a 50/50 mixture of white and wheat flours, which I felt would lend itself best to both sorts of loaves. 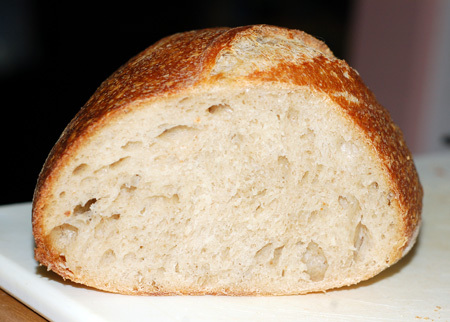 The previous day, I had chosen a basic sourdough recipe with a long, slow rise, and cared for the dough over the course of the afternoon—mixing, resting, kneading, fermenting, folding, shaping, and finally retarding in the refrigerator overnight, cradled in the folds of a flour-rubbed sheet of canvas. Yesterday, just before lunchtime, I removed the two shaped loaves from the refrigerator and transferred them gently to our baker’s peel on a sheet of parchment, slicing their crowns decoratively while the oven heated. They slid onto the heated baking stone still cold, surrounded by pillows of steam as I poured a cup of water into the cast iron skillet below. When they emerged from the oven about 35 minutes later, their crust was a rich brown, pebbly with blisters. I was able to restrain myself for nearly an hour, until the loaves had cooled enough to handle but were still barely warm to the touch. They had caught Nolan’s eye by this time, and he was hovering around the kitchen, stealthily feeling his way across the top of the counter toward them, so I decided it wouldn’t hurt anything to slice off the heel of one loaf and share it with him. The next thing I knew, we had eaten half the loaf slice by crisp, chewy slice, and I was no longer remotely interested in making myself lunch. This bread, as should be readily apparent at this point, was fantastic. Oscar may not have enough development yet to produce a truly sour sourdough bread, but the texture was spot-on: a soft but sturdy crumb and a thin, chewy, crackly crust that we couldn’t get enough of. I think I could eat this bread every single day and not get tired of it. As a matter of fact, I should probably go start some more dough so we don’t run out! This recipe was modified from a book we actually own, but have never really used. I looked up the original recipe after baking the bread and realizing that we owned the source, but I could barely read it. The book is heavily tilted toward bakers who are familiar with bread-baker’s percentages, so the recipe is mostly a big chart. I will have to go back to the beginning and study up, though, because the result was a fabulous loaf of bread. Thanks to Wild Yeast’s “translation” in the meantime! A few brief notes: I used whole wheat flour rather than rye because we prefer that flavor profile and don’t keep rye flour in the house. I also added some whey to the warm water for the dough; I’ve been doing this for all my bread since starting to make my own yogurt, as it adds nutrients and serves as an enhancer for the yeast, and its natural acidity only helps boost sourdough bread’s flavor! I cut the recipe in half here, since a full batch doesn’t quite fit in my mixer. Approximate unsifted cup measurements are in parenthesis. In the bowl of a stand mixer, mix the flours, water, and starter on low speed until just combined, about one minute. Let the dough rest (autolyse) for 30 minutes. Transfer the dough to an oiled container (preferably a low, wide one so the dough can be folded without removing it from the container). Cover and ferment at room temperature for 2.5 hours, with folds at 50 and 100 minutes (fold the dough into thirds, like folding a letter, then turn and fold into thirds again). Turn the proofed loaves onto a semolina-sprinkled peel or parchment. 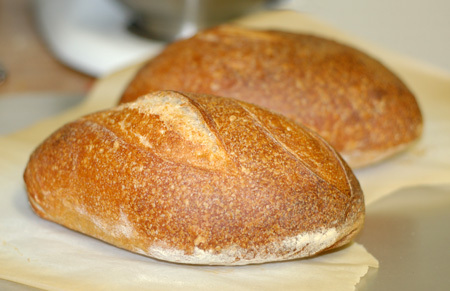 Slash each one with two overlapping cuts that are almost parallel to the long axis of the batard. Transfer them to the oven, add a cup of water to the skillet, and turn the heat down to 450F. For 400g loaves, bake for 12 minutes with steam, and another 15 – 18 minutes without steam. Leave the oven door cracked open a bit for the last 5 minutes of this time, then turn off the oven and leave the loaves in for 5 minutes longer, with the door ajar, to help them dry. The crust should be dark brown. Cool on a wire rack, and don’t cut until the loaves are cool, if you can manage it! Source: Adapted from Bread , by Jeffrey Hamelman, via Wild Yeast. Update 7/17/10: Make sure your stand mixer is big enough for this—mine is 4.5qt and it wasn’t quite capable of containing and kneading a full batch of dough simultaneously, so after the autolyse, I kneaded in two batches. Then I had no room in the fridge to retard that many loaves, so I shaped two and dumped the remaining dough in a Tupperware for a few extra days. Also, make sure you don’t omit the salt! Due to my frustrations with an overflowing mixer, I forgot to add the salt after the autolyse, and the resulting loaves definitely tasted flat by comparison; even the texture of the bread suffered, losing some of that great chew. I saved the remaining dough and used it to make pizza instead, where the flavorful toppings helped disguise the bread’s shortcomings. Update 7/24/10: I’ve made two loaves of this bread every 2-3 days since discovering the recipe. It has officially become our “house bread.” It has perfectly balanced flavors and textures: slightly wheaty but not overpowering, soft enough for sandwiches but sturdy enough not to fall apart. We have been using it for everything from sandwiches to French toast, croutons and breadcrumbs, and just snacking. Update 8/12/10: Our bread has finally achieved a noticeably sour tang. I guess this means Oscar is finally growing up (…sniff)! Thanks, Diana—I saw your bubbly sourdough starter on Facebook. 🙂 Here’s hoping you will have loaves just as tasty as these in no time! My starter is not very sour, but it is super-active. Good thing, since we’ve eaten the equivalent of 6 of these loaves in the past week. Your bread is a Beauty! I’m hoping to get sourdough bread that great some day! I keep working at it! Recipes that are written in weights, especially g, intimidate me! What kind of scales do you use? Any way that I can easily convert it to simple cup measure? I really want to try some of the recipes you share, they just look SO good! My sourdough loaves look slightly different every time I bake them. Lately I’ve been having issues with the seam tearing during baking, and the last time it had a huge ear where I sliced the dough, so I think my shaping is still less than ideal. The bread is definitely tasting more like sourdough with every batch, though! There is no reason to be intimidated by metric weights. 🙂 I have a little digital scale from Salter that converts between metric and Imperial for me, so I just set my mixing bowl on that and zero out the scale between every addition so I don’t have to add it up in my head. It is actually much more precise than using cups, so if you don’t have a scale, I would highly recommend them. I’ll see about measuring out in cups next time I bake, though, which will be either tonight or tomorrow. Thanks for the reply! I’ll have to consider getting a good digital scale. I see so many recipes in weights and I could probably enjoy the accuracy – though I do more dumping and guessing then I should! I tried your recipe! My bread didn’t turn out as high or beautiful as yours but it is delicious! i think with some tweaking and experience, this could be our new favorite family bread! I increased the whole wheat flour to 1 1/3 cups. I really like to use 100% whole grains so that is the directions I’ll be trying to move this recipe. Maybe that will make it too heavy and I’ll lose the great air holes. Did you brush your loaves with something before baking, like egg? Your crust just has much more caramel color than mine. I love 100% whole wheat breads, but I haven’t had much luck baking them yet, which is why this recipe, and my sourdough starter itself, are both combinations. I just used up the last of my WW flour feeding the starter yesterday… time to go to the store! 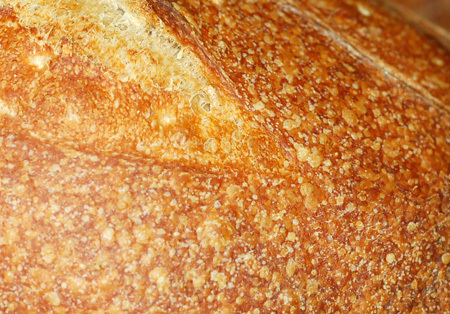 I didn’t brush my loaves with anything… that is all just natural caramelization. I think the use of steam paired with my convection oven really helps get good color on the loaves. But they look slightly different every time, and they still have a tendency to want to tear in the oven; an even longer rise before refrigerating and a different scoring pattern has helped a bit.